today I am working with this: black clay dug from just beneath the sand bars* of the Mississippi River, just north of Memphis. 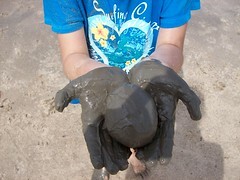 Janie, the eldest daughter of my friends who camped with us, discovered it a mere half-inch underneath the sand. She called me over to ask if it was clay, and if it was, was it clay that I could make pottery out of. Why not? The day before I'd noticed pebbles in the river that smooshed between your fingers when you pressed hard, or that cracked in two when they were dry, washed up on the sand. I remember thinking, "huh. must be clay," but not going beyond that. We all started digging up hunks of clay (a little sandy) to take back home with us. We found a plastic bag (washed up? left by some fishermen?) to cart it home in, and it has been sitting on the stairs to my studio since Monday afternoon. I'm going to go upstairs and try to work with it- since it's black and my usual clay body is white, I'll have a lot of cleanup work to do, but I'm excited to work with it, see how it will fire, and if it will take a glaze. It may or may not- a big experiment. I'll show you what I come up with. *sand plays an important role in Memphians' day to day lives. While most of our soil is clay-based, 350-1000 ft underneath the humus and clay layers are large, white-sand aquifers that purify our drinking water. We have wonderful tap water- clean, clear, good tasting. Thanks, Memphis sand!